Three-game losing streaks have been foreign to the Reds since the first week of June, when they lost four in a row. The home team hopes to avoid three straight losses tonight in the middle game of a three-game weekend series against the Pirates. Before the game, outfielder Adam Dunn, pitcher Fred Norman and manager Dave Bristol will be inducted into the Reds Hall of Fame in on-field ceremonies. Earlier today, meet and greets were held at the Reds Hall of Fame & Museum, affording fans the opportunity to have photos taken with Reds legends Pete Rose, Wayne Granger, Tommy Helms, Jim Maloney, Chris Sabo, Tom Browning, Clay Carroll, Eric Davis, Dan Driessen and Tony Perez, along with Dunn, Bristol andÃ‚Â Norman. More than 20 Hall of Famers are scheduled to be in attendance, including Johnny Bench and Barry Larkin. Blandino is on the 10-day disabled list, but that is strictly a procedural matter at this point. Being placed on the 10-day disabled list means Blandino remains on the 40-man roster. If a 40-man roster spot is needed for any reason later in the year, Blandino will be moved to the 60-day DL. When a player is on the 60-day DL, he does not count against the 40-man roster. Neither Brandon Dixon, who was recalled from Louisville to take BlandinoÃ¢â‚¬â„¢s roster spot, nor Dilson Herrera, the other backup infielder on the major league roster, is suited for shortstop. While nothing has been announced, it seems likely that Eugenio Suarez will slide over to shortstop at any time that Jose Peraza isnÃ¢â‚¬â„¢t there Ã¢â‚¬â€œ at least for the time being. Many things can change over the next 10 days as the interleague trading deadline approaches. Game time is 7:10 p.m. Eastern time. Kingham made his major league debut against the Cardinals on April 29 by flirting with a perfect game. He completed seven innings while allowing only one hit and striking out nine. HeÃ¢â‚¬â„¢s given up more than three runs only twice in his nine starts. Today is the RedsÃ¢â‚¬â„¢ first look at him, so theyÃ¢â‚¬â„¢ll probably be taking a lot of pitches the first time or two through the order as they try to gauge KinghamÃ¢â‚¬â„¢s stuff. Three of DeSclafaniÃ¢â‚¬â„¢s last four starts have been below par, with him surrendering four or more runs in each. Perhaps a slump like this is all part of the recovery process for a pitcher who missed a season and a half with various injuries. HeÃ¢â‚¬â„¢ll need to turn things around in short order to be considered a sure thing for the 2019 rotation. Last night was Ã¢â‚¬Å“hammer timeÃ¢â‚¬Â for the bullpen, as Austin Brice and Jackson Stephens showed why they are effectively the last options for Jim Riggleman. Of the bullpenners who might be called upon in key situations, David Hernandez pitched one-third of an inning and Michael Lorenzen retired three batters. They and everyone else should be available for use this evening. Mets just traded their closer Familia to the A’s for two prospects: infielder Will Toffey and right-handed pitcher Bobby Wahl, along with $1 million in international spending money. Wahl is older Ã¢â‚¬â€ 26 Ã¢â‚¬â€ and has spent this season in Triple-A, where he has a 2.27 ERA with 65 strikeouts in 39 2/3 innings. He has a fastball that touches triple digits. Toffey, 24, was OaklandÃ¢â‚¬â„¢s 17th-ranked prospect, according to MLB.com. A 2017 fourth-round pick, the left-handed hitter was slashing .244/.357/.384 in 48 games in High-A. Honestly, very underwhelming return. Are we sure the Reds can get a good return on moving Iglesias? There are multiple moving parts involved in moving Iglesias and Gennett. 1) What is the return another team will commit to…in-season? Big player trades with years left on contract often get finalized at Winter Meetings (example – Adam Eaton). Familia is a free agent at season’s end. Just the kind of deal A’s would jump at. 2) If the Reds think they can contend for a Wild Card in 2019, then subtracting Gennett and Iglesias to fill other holes immediately can be tricky to pull off. I am definitely in the “Look at the Window starting with Senzel’s first full season in 2020” camp but I can see the other side and why in-season trades look more complicated from Reds POV. From what the Mets are saying , the international money is what they were after. Is this “Suarez to SS when Peraza isn’t available”….this is actually going to happen? The Reds aren’t going to make the playoffs….leave Suarez at 3B. Period. Every game. Try Herrera and Dixon at SS, painful as it may turn out. 2B is Gennett/Senzel anyway, let the kids try SS. Herrera is out of options anyway, right? Put him to use. Would anyone here tell the Rockies to try Arenado at SS if Story was unavailable? Doubtful. Arenado and Suarez are same age 27 seasons, Arenado has better WAR this season, but Suarez has higher wRC+. Same best-at-position caliber. Suarez has a lot of innings at SS and it was actually his original position, so it’s not like asking him to learn a new position on the fly. That said, he seems to have bulked up quite a bit since his SS days, so not sure if he would still be able to field it well enough, as SS requires a lot more range than 3B does. I personally would like to see Suarez try SS again. If he can handle it, it just gives the team more flexibility and, like you said, could let Senzel play his preferred position at 3B. The only question is what to do with Peraza in that situation, as he’s definitely earned more playing time. Peraza can start 59 out of 60 games no problem. It’s not like Suarez is going to play there 3 days a week. Nothing to see here, unless Peraza gets hurt. The Reds infield is set. Peraza is the SS. 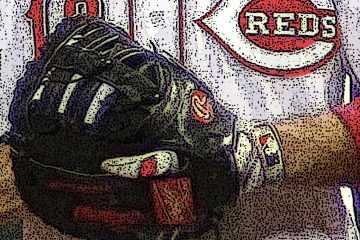 Reds haven’t said….but Senzel must be going to outfield. That’s the big question. Then he needs to play there starting in Spring Training. This would be the best thing to do. Somebody is going to the OF and whoever that somebody is, better spend a good portion of the off season preparing. The question is, where would they play? Winker’s only viable outfield position is LF, so you can’t hide anyone there. It’d be great if Scooter/Senzel/Peraza could handle CF, but it’s not likely (then again, Billy was a SS coming up, and he did alright making the transition…). RF should be Schebler. I doubt any of the 3 can handle RF any better than Winker, although Senzel might be a good enough athlete to handle it. Whatever the Reds are going to do, they need to make a decision and stick to it. No more half measures. Yeah they’ll set alright. Peraza is their SS and Homer is in the rotation. Most teams have a different formula though. They try to put the best players possible on the field. Well TY for the generously kind words Seat! Well I’m glad you missed that game too. Hope you had a good night with your kids! It’s looking like tonight might be a good night to miss too. Also I may be wrong, but even if Blandino goes to the 60 man doesn’t he have to be added back to the 40 during the off season or am I imagining that? 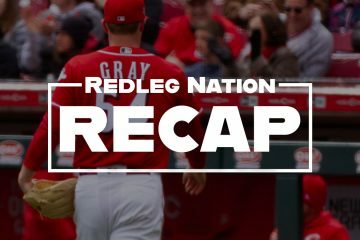 Yes, the 60-day DL clears during the off season requiring adjustments for the 40-man roster, but adding Blandino to the 60-day DL now, allows the Reds to add a player to the 40-man roster now as a temporary arrangement for a backup SS on the 25-man roster without having to DFA someone from the 40-man roster. The backup SS could likely come from a minor league FA that would be DFA’d after the season. So does Duvall get an assist there? I’m thinking yes? Yes. The runner isn’t considered “safe” until the play is complete. Just like when a guy seems to have a base stolen but over-slides and gets called out, it goes as a “caught stealing,” not a stolen base and an unassisted putout. Thanks! Of course if he didn’t jog for the first 4-5 steps then he makes it with his speed. Its hard to find a guy that will run 100% out of the box any more? Joey Votto can be a baffling guy. He obviously understands the value of a walk more than anyone, but he swings at a borderline 2-0 pitch when the pitcher has just walked the first two guys, with an all-star due to hit next. Just not smart baseball. I don’t get it. I agree. He’s impossible to read in every phase of the game. He’d be a great poker player! I think in that situation Votto needs to swing away every once in a while rather than taking. He probably felt he could crush the pitch, even if it was borderline. He is one guy I can’t criticize for swinging away. Dickerson again. 3 of his 10 HR’s this years vs the reds. He wasn’t drunk. Have you ever seen him before? He’s always been full of energy. Full of energy and Skyline. Yep. Good walk in the first. Peraza gets me to 20 in the Beat the Streak contest. When I win the 5.7 mil, I’ll still come around and be a regular guy:) Peraza literally can make any ball at any velocity into a hit….its amazing really. And he can catch line drives! All but at least 6 of them, which makes him 6 behind everybody else. Reports are saying the Orioles are getting nice offers for lefty closer Zack Britton. I really think we need to be moving Iggy along to get a starter! I don’t know that we have anybody good enough to be better then a 3rd starter? Maybe Lorenzen but they can’t see the forest thru the trees on him? Has there ever been anything specific about giving Lorenzen a chance to stretch out? Once his arm started barking again in spring for the 2nd time as a starter, they seem to have abandoned it. Are you kidding me? That was a great plau! Rules clarification based on that last at bat. Disco threw a ball in the dirt with 2 strikes, 2 outs, and the bases loaded. If the hitter had swung and missed on that pitch for strike three, could Casali have just stepped on home plate for the force? I assume that’s the case but I’ve never seen it happen. I just tuned in to see that Peraza has been on base twice in two at bats and it looks like the same game as last night. Any word on the restart? Bring Disco back after the delay and let him pitch to two batters? Why roll DeSclafani back out after a rain delay? He is producing a mighty minus .3 WAR and just looking to finish the season healthy. It wasn’t like he was on a no-hitter or anything. Disco absolutely needs to get it together, for his career sake as well as the Reds thinking of contending next season. Can’t expect to have Castillo/Mahle/FA/FA/FA as your rotation and just expect to win 90 games. (Assuming Reds would pay/trade for 3 new SPs). Homer and This Version of Disco is not getting the Reds SP where it needs to be. Dickerson 2 homers and good guys 2 hits.He leads 2-0 and they lead 3-0.Disco for 2 batters is a why for me too? Stop the feel good presses. This team is 12 under and getting worse. 90 losses is on the horizon. ….again. I agree Old School and I love the way they have been playing but we are who we are. I was worried that the allstar break might screw up their momentum. Looks like I was right. Yep because we look like we are sleep walking especially at the plate and at home.One run in 14 innings well is just not good at all. Momentum can be affected by four days away from the grind and two rain soaked games. The offense will be back. I’m not so sure about the pitching. Peraza just did another feet-first (instead of glove-first) dive for a ball up the middle. He came up empty–of course–and it cost us two runs. I’ve seen him do that twice before this year. Terrible fielding technique. Eerily similar post…we are seeing the same things. Fundamentally unsound. YouÃ¢â‚¬â„¢re right. He was in an awkward position but he shouldÃ¢â‚¬â„¢ve dived. IÃ¢â‚¬â„¢m not certain he gets to it but it gives him three or four more inches. Even if he just knocks it down he still has chance to make an with a Pirate tootblan. Peraza again sliding feet first at a ball up the middle. 2nd time in two weeks he’s done that. Cost 2 runs there. Glad I’m not the only one seeing this. Drives me crazy. Won’t matter if its 3-0 or 5-0 cause we aren’t even showing any fight at the plate. Only one team showed up tonight. Scooter and Votto go down on the first pitch and Suarez strikes out on 4 pitches.Yep we are ready to go get em in the second half. They had a little run, but the boys want to lock down last where they belong! Time to ship off Billy for a case of warm beer again. 90 losses definitely back in play! Only about 5 weeks away from college football! I’m taking a break….or a BobSteve protest! He can’t be any worse then these other guys? C’mon, Indy! Two games? Balanced against 30 or more? It’s insane to extend Gennett for tens of millions of dollars past age 30 when he can’t throw a baseball at 28. Your probably right and that’s the way it should be.We haven’t needed a closer in what now 5 years.Hope they can package him with others to fill a need.